The Fire Wish by Amber Lough. Review: Have you ever wondered what it was like to switch places with someone you've never even met? The Fire Wish by Amber Lough is the one to read for anyone who loves fantasy books! 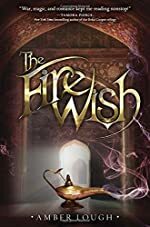 The Fire Wish starts off in India, where there's a great war between the mystical jinni and the humans. A girl from a tribe near Baghdad named Zayele was picked (more like forced) by her father to be the bride of the prince of Baghdad. Najwa is one of the mystical jinni who wants to be one of the people in the Corps to fight in the war (they also grant and make wishes). While Zayele is on her way to the city of Baghdad to marry the prince, she wishes to run away and go back home. But Najwa appears and Zayele catches her to make a wish. Zayele wishes to have them switch roles and Najwa grants that wish. Want more? If so, then you'll just have to read this novel! The Fire Wish is recommended for anyone who loves fantasy/fiction books. I loved how Lough incorporated humans and fairy-like people such as Najwa which for me, makes this such an interesting book! The book also includes two-sided perspectives, which can be confusing at first, but you'll get it once you know what's going on. It shows you that even though you want something, it doesn't really mean that it'll come out the exactly how you wanted it to go. You probably wouldn't even know how to solve it. I loved this book, and hopefully, others will read it too! Review written by Carol (6th grade student). We would like to thank Random House for providing a copy of The Fire Wish for this review. Have you read The Fire Wish? How would you rate it?